We have carved a niche amongst the most trusted names in this business, engaged in offering a comprehensive range of Yellow Ochre Powder. 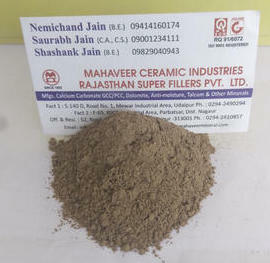 We Prime Minerals are manufacturer of Micronized Red, Yellow Ochers, Dolomite Bentonite Powder & Oxide Clays. Serving the best quality products to our customers is our main aim and owing to the same, various quality checks are conducted under the supervision of our quality control executives. Ochres is a natural earth pigment containing hydrated iron oxide, which ranges in various color from Red, yellow to deep orange or brown. Pigment has been processed to improve color predictability and micronized for easy of dispersion. Ochres are processed under strict QC and environmental control for reliable and consistent quality. Visual and spectrometer tests are conducted on each lot to maximize consistency and quality. Its yields reliable performance properties which offer outstanding light fastness, sun light, weather resistance, chemical & alkali resistance. Broadly acknowledged for their quality, our organization is engaged in offering a vast range of Yellow Ochre Powder.This ocher is mainly used in paint and pharma industries. In addition to this, Clients can avail the entire array from us at affordable prices.